Sold per meter, cut from a bulk roll. Wholesale discounts automatically applied in cart for 10m and 22m rolls. This transfer tape has a blue gridline. It is different to the (old) transfer tape with red gridline (no longer available). 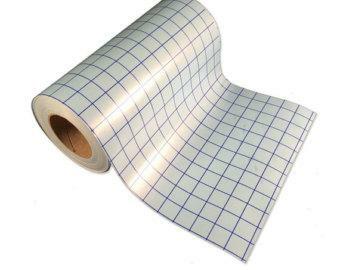 Some customers have complained that this new transfer paper (with blue gridline) is not sticky enough. As an alternative, consider using many other similar products recommended below. We still process many repeat orders for this product, so we will continue to stock it. Transfer tape does not need to be cut. It is a companion product for use with all vinyl types. Cricut Vinyl Strong Grip Transfer Tape 12"X48"